The Kharkov winter usually starts in December with snowfall until mid March. Westerly winds frequently cause a temporary light thaw which soon re freezes. It is not unusual for snowfall to reach several feet in depth during the typical 130 day winter. 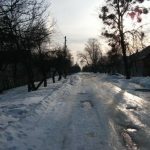 The summer weather in Eastern Ukraine is usually mild/warm with temperatures in the mid 20’s, however in June 2010 temperatures reached a staggering 36° which is almost unheard of in this part of the world. Checkout this screenshot from Google. Khakov’s weather is described as continental and moderate with cold winters with significant snowfall while summertime is warm but not frequently hot. The driest month is March and the warmest is July.